I have a card to share with you today that I made with two of the Sale-a-bration stamp sets: Petal Parade and You’re Lovely. I used the colors Wisteria Wonder and Perfect Plum with Pistachio Pudding for this card. 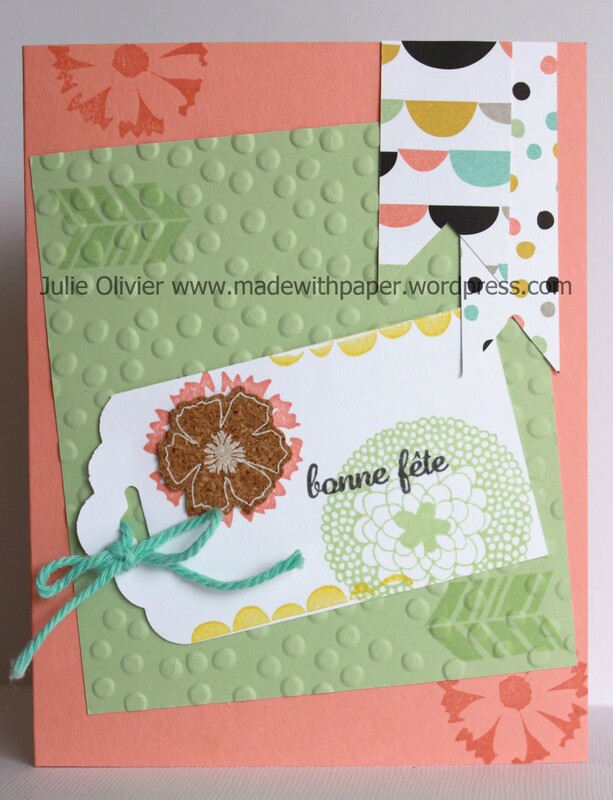 Tools: Big Shot, Fancy Fan embossing folder, Scallop Trim Border punch, Deco Label Framelits. 1. Cut half a sheet of Perfect Plum card stock. Fold in half to make the card base. 2. Cut a 5” x 3-7/8” Whisper White rectangle. Run through the Big Shot with the Fancy Fan embossing folder. 3. Cut a 5” x 2-3/8” Wisteria Wonder rectangle. Use the Scallop Trim Border punch to make the scalloped edge. 4. Cut a 1-1/2” strip of Whisper White card stock. Stamp flowers from ”Petal Parade” stamp set with Wisteria Wonder, Perfect Plum and Pistachio Pudding ink. Adhere on top of the Wisteria Wonder card stock. Adhere on the embossed Whisper White card stock. Wrap around a White Organza ribbon and secure the two ends of the ribbon with Snail adhesive at the back. Adhere on the card base. 5. 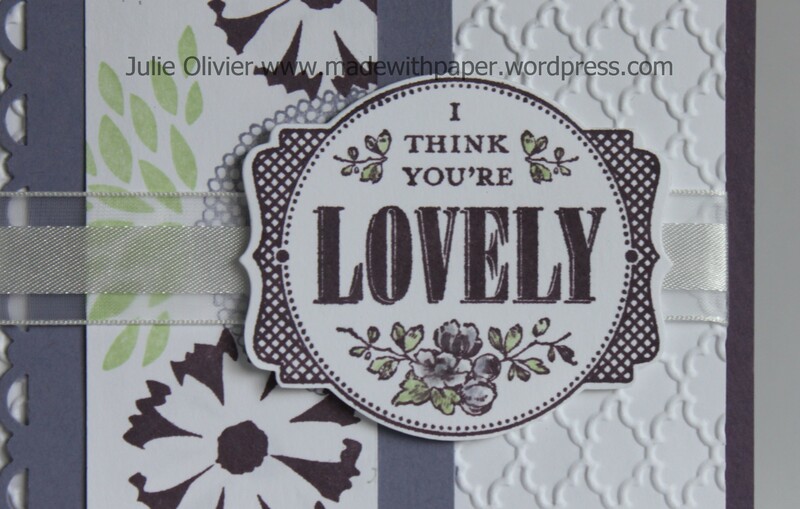 Stamp the ”You’re Lovely” stamp on a piece of Whisper White card stock in Perfect Plum ink. Cut using the matching Deco Label Framelits die. Use a blender pen and ink from Wisteria Wonder and Pistachio Pudding to color the little flowers. Adhere on your card with Dimensionals. Today’s card is another “Sale-a-bration” card! 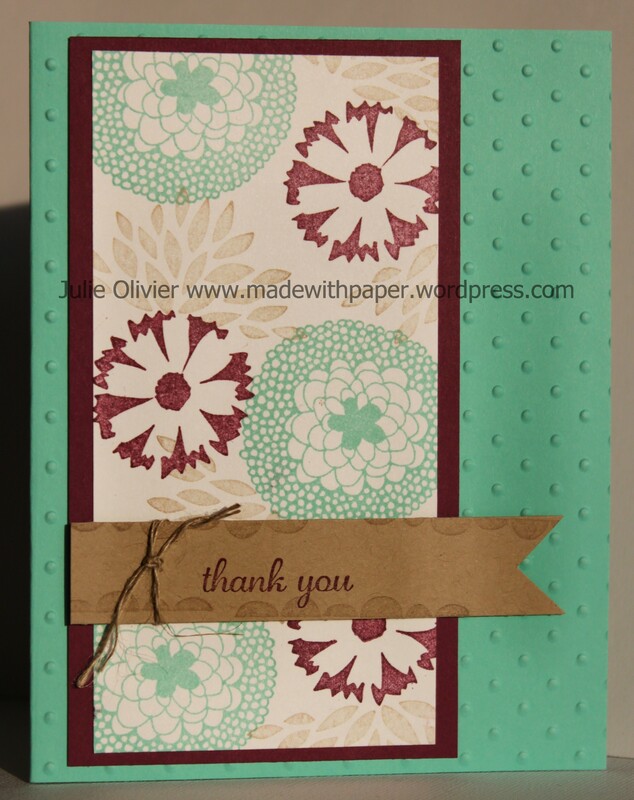 I used the Petal Parade stamp set and the Sweet Sorbet Designer Series paper and Accessory pack. This accessory pack includes 1 sheet of printed adhesive-backed cork and 3 spools of twine (10 yards each). These embellishments coordinate very well with Petal Parade stamp set and Sweet Sorbet DSP. You can get any of these items FREE during the Sale-a-bration (with a $60 order). The sale ends at the end of March. Don’t miss out! I used the new Scalloped Tag Topper punch to make this cute tag and used the twine in the Sweet Sorbet accessory pack to tie a little bow. 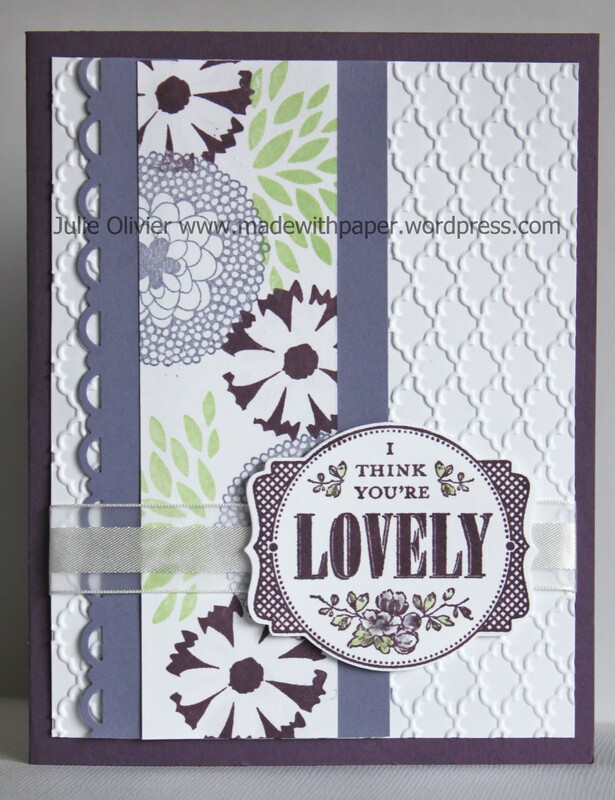 Today’s card is made with the Petal Parade Sale-a-bration set. It’s a simple card, based on the colors from the Sale-a-bration Sweet Sorbet Designer Series paper: Crisp Cantaloup, Pool Party and Pistachio Pudding. The greeting is from the set “Four You”. I used the twine from the Sale-a-bration Sweet Sorbet accessory Pack to underline the Birthday Wishes and the Scallop Trim Border punch. 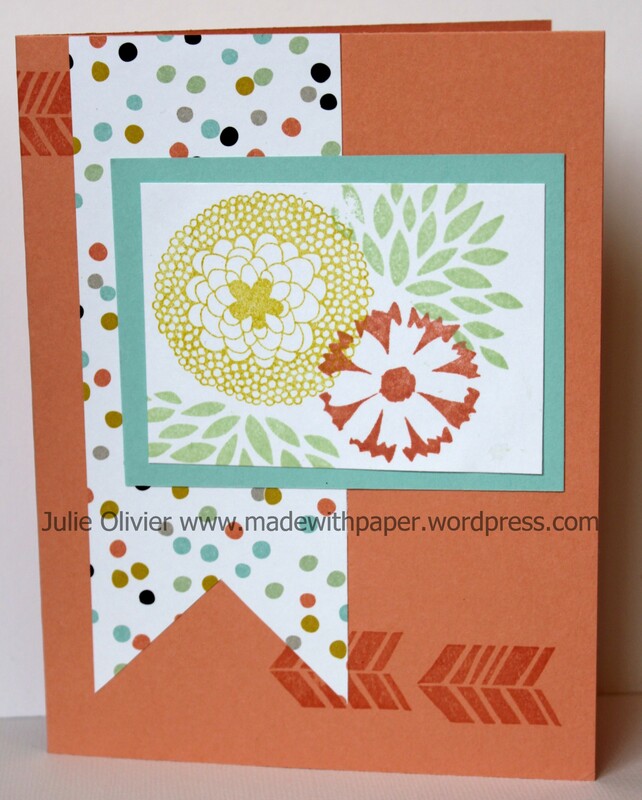 Today’s card is made with my favorite Sale-a-Bration stamp set, called “Petal Parade”. I found that set very versatile and fun! The color scheme for this card is Coastal Cabana, Rich Razzleberry and Crumb Cake. The background is embossed with Perfect Polka Dots. The greeting is from the hostess set “Express Yourself.” A little linen thread is attched to the Crumb Cake pennant and adds a nice finishing touch! 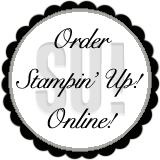 To order any material, visit my Online store here! I made this card to show many different Sale-a-bration products that you can get for free with any $60 purchase. I used the Petal Parade stamp set, the Sweet Sorbet Designer Series paper and Accessory pack (cork flower and twine) and the Decorative Dots embossing folder. Which item is your favorite? I used the color from the Designer Series paper, Crisp Cantaloup and Pistachio Pudding and also Summer Starfruit for the card stock and ink. 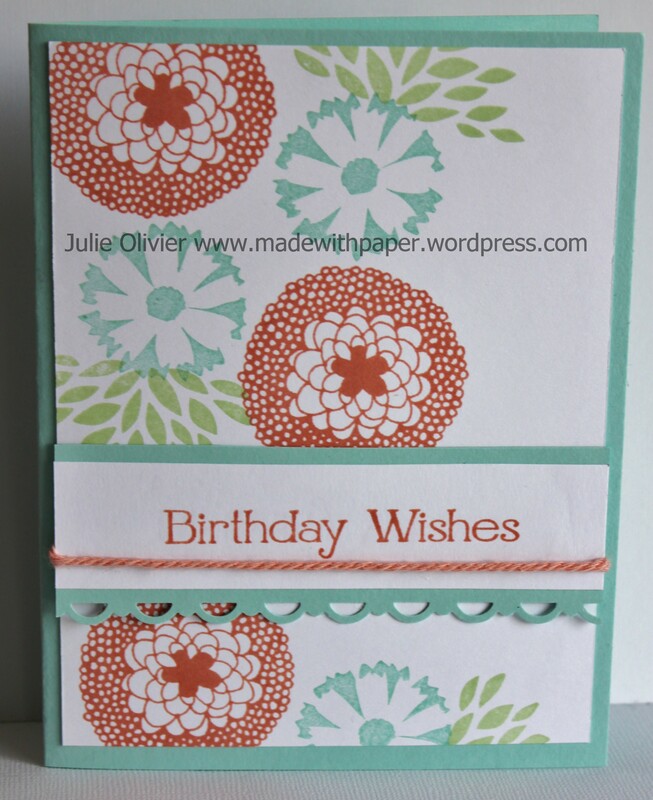 The Scalloped Tag Topper punch is really fun to make card with and I used it on this one. I used the Pool Party Twine from the Sweet Sorbet Accessory pack (free Sale-a-bration item) to tie a little bow. Sale-a-bration is a really fun time of year! 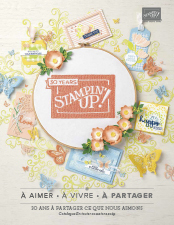 Beat the winter blues with some stamping and free products!!! For every $60 you spend, you can choose a free item from the Sale-a-bration brochure! There’s 13 items to choose from! Click on the brochure to find out more! 1- Take half a sheet of Crisp Cantaloup card stock (8-1/2″ x 5-1/2″) and fold in half to make your card base. 2- Stamp the “arrows” with Crisp Cantaloup ink on your card base. 3- Cut a 2″ x 5″ strip of Sweet Sorbet Designer Series Paper. Cut a flag shape at the bottom. Adhere on your card base with Snail adhesive. 4- Cut a Pool Party card stock rectangle 3-1/4″ x 2-1/2″. Cut a Whisper White card stock rectangle 3″ x 2-1/8″ . Stamp the flowers and leaves with Summer Starfruit, Crisp Cantaloup and Pistachio Pudding ink. Adhere in place on the card.